High output with optimal energy performance is one of the goals every plastics processor desires to achieve in produc-tion. battenfeld-cincinnati supplies the machinery solutions for this purpose, for example the conEX series of conical twin-screw extruders. This series incorporates not only the experience from more than 7,000 conical machines already delivered, but also the manufacturer’s commitment to energy efficiency, which the extruder specialist underscores by its membership in the VDMA (German Engineering Asso-ciation) BlueCompetence initiative. The highlights of the new machine generation also include a small footprint, a long service life and a “green” control system. 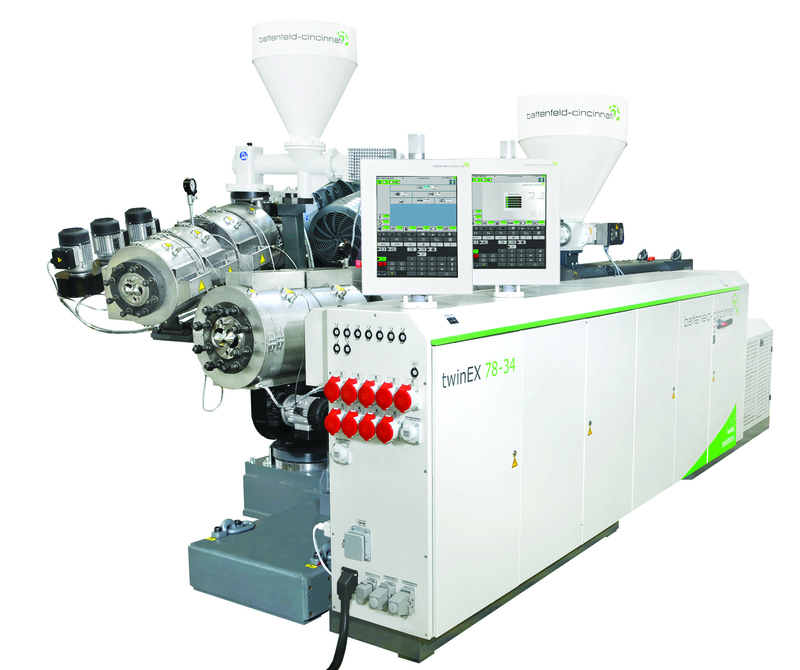 The conEX extruder series comprises four models with screw di-ameters ranging from 38 to 72 mm and constitutes the 6th gener-ation of conical twin-screw extruders from battenfeld-cincinnati, based on the proven predecessor series of konos extruders. The screw geometry has been further optimized, so that increases in output of up to 10% have now become possible in both pipe and profile extrusion (for pipes up to 550 kg/h, for profiles up to 280 kg/h). The conEX models reach a high level of energy efficiency thanks to a tried-and-tested, complete barrel insulation system. It includes the proven barrel insulation in the feed and degassing zones and, as a complete novelty, thermal separation between the metering unit and the barrel feed opening by means of an insulating plate. An improved vacuum aggregate, pumps with reduced water vo-lumes and a new vacuum filter complete with filter sump also con-tribute to saving energy. 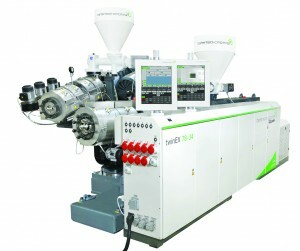 Maintenance-free, energy-efficient AC drives for all extruders, Intracool screw tempering and the apc (air power cooling) system of the barrel have already been included as standard in the battenfeld-cincinnati equipment packages for many years. A long service life for the new models is ensured by a molybdenum screw coating, which is unique in the industry. The complete width of the screw flights is covered with an extremely pure layer of mo-lybdenum to protect it from wear.Due to their minimal footprint, conEX extruders also lend them-selves ideally as coextruders. Piggyback configurations and space-saving lateral configurations are easy to implement thanks to a flexible machine frame design. Last, but not least, the new extruders come with a special control system featuring optimized regulation systems for efficient use of energy and materials. 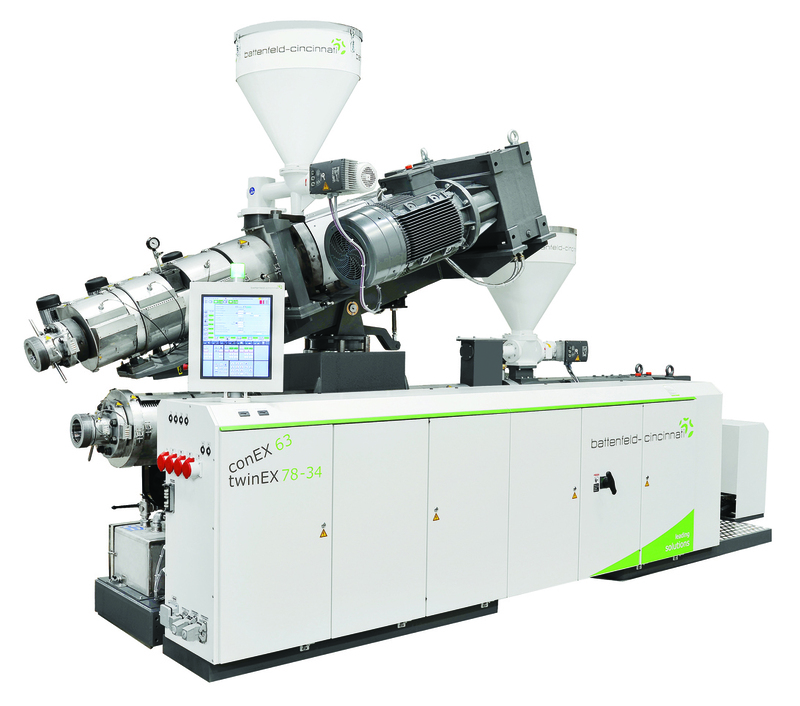 A digital, self-optimizing regulator specially developed for extrusion technology ensures the best possible tem-perature control for the extruder and minimum weight per meter. A clearly arranged touch screen facilitates intuitive operation of this “green” control system.